Build your own model solar boat! F1 Powerboat demo! There will be a model solar boat competition for children (ages 8-15) attending Saturday, June 10. There will be an F1 Powerboat demonstration on Saturday around noon. Lunch on Saturday is available for a cost from Riddles BBQ. 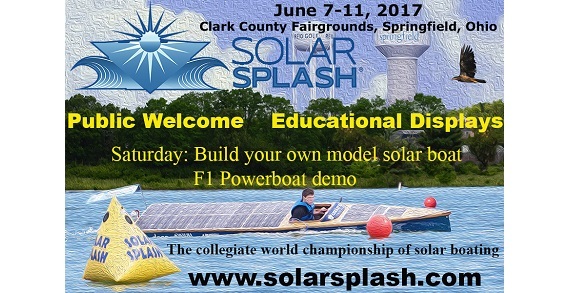 Solar Splash is the World Championship of intercollegiate Solar/Electric boating. Its official name is “an international intercollegiate solar/electric boat regatta,” and it takes place over five days. Technical Inspections are done on the first day, and the remainder of the time is occupied by five on-the-water competitive events. Points are earned in 7 categories starting with Technical reports that are submitted before teams arrive at the competition. On-site competitions include Visual Displays and Workmanship. On-the-water events begin with a Sprint and a Maneuverability qualifier. This is followed by an event called the Solar Slalom, which is a combination of speed and maneuverability. The final days are spent in the Sprint and Endurance events.